Here I sit: at a table with four other mothers painting mugs. We talk about our goals for the year, painting them in word and symbol on coffee cups as daily reminders. I doodle paisleys on a sheet of paper, practicing before committing them to the coffee cup, and think of the short story to edit, the essay to write, the sermons I'm preaching in a few months. I think of the bunny I want to knit for Grace, the Buzz Lightyear costume I want to make for Keegan, the twirly skirts I want to sew for Annie, and I wonder how to be a mother and a writer. I consider goals of a better routine, more discipline, or more balance. Exercise in the morning before the kids wake up. Clean their bathtub on Mondays. Mop the kitchen on Tuesdays. (Incidentally, these are the only two chores that get done weekly.) Write during nap time. Knit after they go to bed while we watch Dexter. In this way, I think, I'll finish Annie's sweater before winter ends, start writing the novel that's dancing through my neurons, and make my own soap with lye and oils. Here I sit: tablet and keyboard balanced on my knees, sleeping baby stretched across my chest. The other two are more or less asleep in their rooms for nap time, and I write. I can do this, I think. I can be a writer and a mother. An idyllic portrait of words and tranquility and snuggles. Until the baby awakens, anxious to try her new rolling skills, deviously charming me with coos and smiles so I'll ignore the words and play with her. And I realize I forgot to put dinner in the Crock-Pot that morning. And I'm too exhausted at night to make it through a full episode of Dexter, let alone knit. I cannot be the writer I want to be and the mother I want to be. As a writer, I want to write stories that engage imaginations; that speak within the greater dialogue of artists, theologians, and scientists; that make the outsider feel less alone. As a mother, I envision a home heavy with books, canvases, and music; walls scarred from science experiments; the patio lined with buckets of collected leaves, roly-polies, and rocks. I want my kids' first impulse to be to create: biscuits, clothes, toys. And I want to be present with them, dancing to "'Vinsky's jumping music" (i.e. Stavinsky's "Rite of Spring"), reading Giraffes Can't Dance for the 54,887th time, baking a chocolate cake to celebrate a Tuesday. As much as motherhood has taken away — time to write, the ability to practice the piano without little hands taking over the keyboard ("Scooch, Mama”), the mental acuity to use polysyllabic words (or, some days, to finish sentences) — it has given me more. I have not lost myself in motherhood, as I had feared, but discovered myself. I don't just mean I've realized the beauty and joy of being a mother, but in and through motherhood I've grasped new ways of being creative. I learn creativity from my children, who are infinitely the same as and different from me; I learn creativity through my desire to create for them; I learn creativity simply by opening myself up to being something else. In my past, to take up a task has meant single-minded devotion. As a musician, I practiced daily. I set aside writing. I took music theory classes instead of English Lit. I spent weekends in practice rooms. When I took up writing as a profession, I did so with passion and persistence. I spent most of my day — and most of my days — writing. I lived according to a schedule. When not teaching music lessons, I sat in front of my computer mornings, evenings, and weekends. These days, I spend most of my day — and most of my days — cleaning up finger paints and sweeping pecans and leaves off the trampoline. Attempting to maintain a regular schedule is like holding Warrior 3 on a sailboat. The more I strive for balance, routine, and discipline, the less I find myself embracing the small, passing joys of now — wishing on dandelions, digging in our backyard for dinosaur bones, sipping tea out of miniature cups with a baby doll. Here I sit: a sleepless night, pen and journal in hand. The pieces of me threaten to rend my life. I write on the woven paper, "At what point do I accept that I am not a writer? When do I put away pen and paper?" It comes to this: do I single-mindedly pursue writing with its discipline and routine, its rigor and focus, giving up the knitting projects and homemade yogurt, or do I practice creative motherhood and put away thoughts of novels? Just as I settle on one answer or the other, a phantom itch nags at me — a character for a novel, on the one hand, or a pattern for a skirt, on the other. All of it is part of me, and all of it reflects my Creator. Practicing creative motherhood engages my imagination in new ways. Writing (and preaching) connects the themes and lines and arcs of life. Motherhood teaches me to notice the small things of life. Writing teaches me to reflect on those things. So I take a risk and embrace both, but I do so knowing I will fail. I'll topple out of my Warrior 3 pose. Knitting projects won't always get done before the child outgrows it. Short stories won't always make it into a journal. Sermons will fall flat. The other day Keegan, Annie, and I pulled out the Play-Doh. “Make a bird's nest, Mama,” Keegan said. Then, “Make a flower.” Then, “Make apple pie.” I made piecrust out of pink dough and filled it with green wedges. We cut three slits on the top crust and baked it in an oven formed with blue Play-Doh. Then Keegan sliced pieces for each of us. 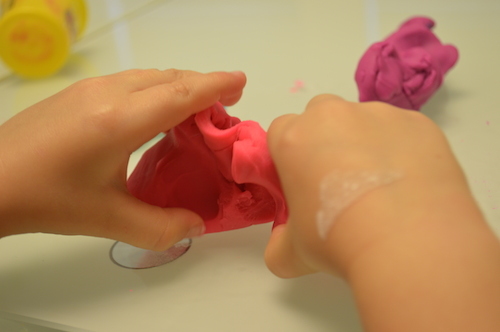 As he did, he mashed together the green Play-Doh and the pink. I tried to separate the two, but they had become inseparable. Then I noticed how the green and pink swirled together in a beautiful pattern as we squashed it and formed new shapes. It's okay to mix Play-Doh colors. Motherhood and writing become inseparable, swirling together to form beautiful patterns. Here I sit: at a table with four other mothers painting mugs. With purple paint pen I write in loopy calligraphy, "Enjoy" next to my paisleys. This is my goal for the year, whether writing, preaching, or making caterpillars out of felt. Some days it means grabbing a Mead notebook to scrawl a stray thought while the kids paint. Other days it means cuddling with a sleeping baby during nap time. I'll save balance, routine, and discipline for later. Heather A. Goodman is a wife, mother of three, writer, and Pinterest addict who has pinned more patterns than she'll ever create.